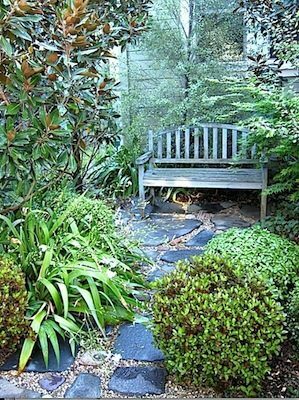 A PORTION of the columnist’s “home ground”—a corner of her Larchmont Village back garden, photographed in March. Garden design by Judy Horton. The garden writer and philosophy professor Allen Lacy didn’t believe in the conventional wisdom of the green thumb. He was certain that it was the “gardener’s eye” that induces otherwise normal people to pick up the trowel and not let go. I agree. It’s like a conversion: one day a tree is a green generality and the next it’s a graceful, multi-trunked, white-blooming crepe myrtle, Lagerstroemia ‘Natchez’. So there you have it: gardening raises the heat of the life force and, perhaps, some fierce perfectionism. I’ve heard myself say to a sister gardener: I wish you could have seen my beloved Winifred (Salvia clevelandii ‘Winifred Gilman’) before (choose one): I overwatered it; I chopped it almost to the ground; the sun scorched it during February’s freak heat wave. I’ve also felt a profound kinship—one that defies expression—with six Japanese maples. But that gardener’s eye can take a nap, too, which mine did until recently, when it again saw the light. Gardening is an intimate transaction of the mind, the hand, and the spirit with the materials of the natural world. I had deeply missed the hands-on. With a construction crew next door for nine months, I had no privacy. That’s what I told myself, anyway. When that eye opened, I was mortified to see the neglect. Many of my friends are professional gardeners. What would they think about the brown-edged creeping thyme and the failing lavender? Where does all this come from? It’s a question for the ages. “No doubt about it,” writes the British garden historian Christopher Thacker. “The first gardens were not made, but discovered.” He imagines a clearing in the forest, a valley in rough mountains, trees abloom, streams meandering. No one tends them—they were freely given, and an idea of sacredness takes hold. No surprise that the idea of garden as paradise takes root in the cultural imagination. Fifteen hundred years before Homer, in the Sumerian/Babylonian “Epic of Gilgamesh,” a mineral garden of the gods is praised—vines of carnelian fruit, leaves of lapis lazuli. The tombs of ancient Egypt are adorned with paintings of lovely gardens. Holy books describe paradise as a garden. Homer in “The Odyssey” sings of the grove with alder, poplar, fragrant cypress. But something else in “The Odyssey” sets my own imagination aflame. Robert Pogue Harrison, in “Gardens: An Essay on the Human Condition,” provided the spark. Odysseus, in his exile, seems to Harrison to be emblematic of the mortal human being and an awakened heart. Odysseus longs to care for his wife, his homeland, his human identity, despite all the woes that caring may bring. In other words, “caring” defines us as human beings. We “experience time as the working out of one care after another,” Harrison writes. It’s also how we define ourselves, individually. What calls out for our attention? The garden keeps the gardener on her toes and in the dirt.